Two wildfires burned in regions of Southern California for 13 days at the end of 2018. The total destruction caused by these fires includes 96,949 acres, 1,643 houses, and at least three lives. What the data doesn’t include are the numbers of low-income individuals and families who lost their jobs — and in some instances their family’s entire income — to the fires. When the Southern California community experiences extreme devastation, residents are quick to act and support their neighbors in need. These wildfires were no different and a short amount of time, United Way of Greater Los Angeles, along with CBS Los Angeles and The Los Angeles Rams, raised more than $2.5M to support long-term wildfire recovery efforts for low-income individuals and families throughout Southern California. The supporters came from many different organizations, financial situations, and even locations countrywide. But the youngest supporter by far was an incredible young man named Teddy. 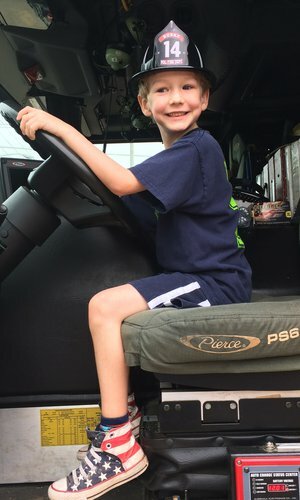 This 7-year-old from Virginia, has always had a love for first responders and when he learned about the devastation caused by the wildfires in Southern California he jumped into action to help. But he did his research first and spent his days reading the newspaper and watching TV news with his parents in order to learn of updates in real time. Then completely on his own, Teddy came up with the idea of Cocoa for California, a street-side fundraiser that would sell hot cocoa to help raise money to support the cause. The event was a resounding success. In total, Teddy and his family raised $751 and donated it to United Way’s Disaster Relief Fund which, to date, has raised more than $2.5M to support those low-income individuals and families affected. To learn more about how funds raised through United Way’s Disaster Relief Fund will be used to support long-term recovery efforts, visit unitedwayla.org/2018fires or read the latest Disaster Relief Fund press release.